This special plant grows only in Wakanda specifically on Mount Kanda in a section called “the Valley of the Panther”. The Heart Shaped herb has been described as a natural “super soldier serum” enhancing all of ones physical attributes to above peak human levels; enhanced speed, agility, strength, endurance, healing and senses. With senses enhanced the person can see in pitch blackness, track a person by smell and differentiate multiple smells in a given vicinity, easily lift a man with one hand and easily break a mans bones with a single punch. It also creates a connection between the person and Bast the Panther god. The Only people who can survive the ingesting of the herb are those of Royal Wakandan Blood or someone worthy. Those not worthy have either been poisoned by the herb or had their spirit devoured by the panther god. It should be noted only Eric Killmonger has been known to survive eating the herb though he fell into a coma. When he awoke he had none of the enhanced powers. Their have been conflicting accounts of how one can gain access to the Heart shaped Herb. 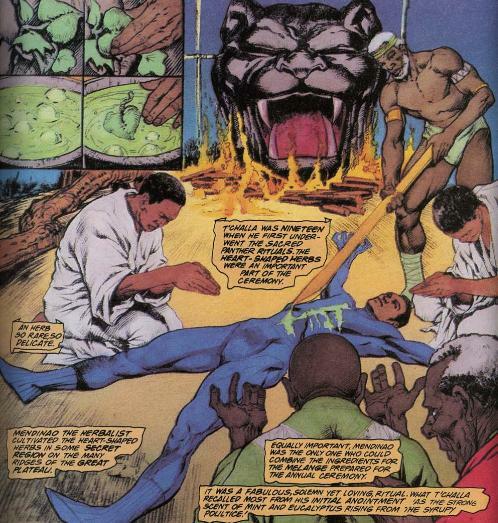 One way is to defeat the reigning Black Panther, then six of Wakanda‘s greatest fighters and various other challenges before being allowed to use the herb. 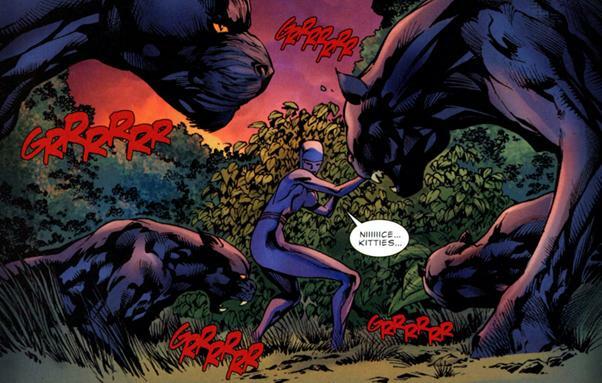 In Black Panther: Deadliest of the Species when a Black Panther is appointed when another is incapacitated or dead they must walk barefoot across fire, dodge a series of arrows and spears, meditate without being stung for six hours in a pit of scorpions and then scaling a mountain unaided and then sneak or fight your way through more than a dozen black panther’s who guard the herb. Their have been conflicting accounts of how one gains the powers of the herb. One account has the herb brewed and then it’s juices are applied to a wound made on the chest. The Other is a simple eating of the herb which sends the mind to the realm of the Panther god to be judged.